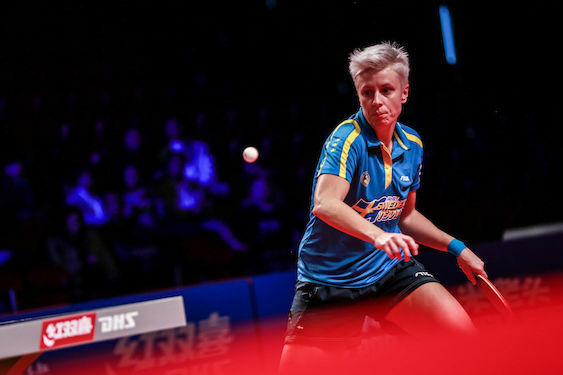 Two years ago, in Dusseldorf, Sweden’s Matilda EKHOLM has been upset twice in the opening round of the Liebherr 2017 World Table Tennis Championships, in the Singles and Doubles event, but she managed to reach Mixed Doubles quarter-finals, playing alongside her compatriot Mattias KARLSSON. Actual world no. 30 is looking forward to her 8th consecutive individual World Championships to be held in Budapest (April 21-28), hoping that she will be able to surpass her best results: last 16 in Singles (2015), last 32 in Doubles (2007 and 2015) and quarter-finals in Mixed Doubles (2017). “I have small injury in my shoulder, but general feeling is good. I hope I can fight for medal in Doubles and Mixed Doubles and to reach Top 16 in Singles. Yes, I will have a chance especially in Mixed Doubles and Doubles, but of course it will not be easy”, stated Matilda EKHOLM who will be no. 10 seed in Women Doubles, playing together with her teammate from TTC Berlin Eastside, Georgina POTA of Hungary.